We are thrilled to present our 2018 Ambassadors. We are excited to be working with these amazing women to help spread our passion for the outdoors. They will be sharing their knowledge and passion of the outdoors with you throughout the year. Sabrina is a proud single mom of three. She has a son in medical school and twin girls in nursing school. They had a great role model as Sabrina is an RN. Sabrina has recently gotten engaged and will be lovingly doubling her family. She also has her own small business empowering people to take care of themselves using essential oils. She loves teaching women about natural alternatives to support a healthy lifestyle. She has a strong Christian faith and her love for Jesus gives her strength. You will find Sabrina camping, hiking, Kayaking and fishing in her free time. She loves the outdoors and finds great strength and peace there. "Being outdoors soothes my soul and is my happy place. To sit by a campfire listening to the crackling wood and sleeping under the stars is better than any antidepressant!" Anna is an outdoor enthusiast and has always loved the outdoors. She is a mother and a nurse and is always looking for ways to learn more. She plans to get her Wilderness First Responder Certification soon. You can find her sailing, scuba diving, backpacking, or kayaking just to name a few. Anna's love really took off in 2014 when she took a travel assignment in Yellowstone National Park. There she learned a lot about the outdoors and soon learned to be comfortable exploring the wild places. Anna has logged many miles hiking in Yellowstone, Glacier, Yosemite, Ecuador, and many other places. She is excited to share what she has learned and how empowering that feeling is when you know how to safely explore. We are so excited to have Anna share her stories and passion with you all. Shannon is a mom that has overcome a lot of difficult events in her life. She is a shining example of how we can take difficult situations and turn them into positive things in our lives. Shannon lived in what she calls "my safe little box" where she was comfortable but miserable. It seemed each year brought a new difficult event but Shannon chose to begin a path that she would find her strongest self. In addition to the life changes that occurred, she also began to tackle her fears and break out of her box. Although afraid of water, she went kayaking. She has also zip lined, loves camping, and enjoys hiking. Shannon and her son are on a mission to visit every state park in Georgia, of which they have visited twenty-one to date. Her favorite outdoor activity is hiking. Shannon also trains in Brazilian Jiu Jitsu and regularly attends her gym. She has been busy with school and is close to a bachelors degree in Sociology. In addition to all this, she has a full-time job. "I'm not here to be average; I'm here to be awesome." These sisters grew up in the mountains of New York always spending time outdoors. They spent their time hiking, kayaking, canoeing, camping, fishing, horseback riding and of course playing in the snow. Theses sisters attended 4-H when they were younger, learning all sorts of things about nature. This blossomed their love of the outdoors. Now as adults, they continue to love the outdoors and share it with their two dogs. Brittany has conquered many 5K's, triathlons, and obstacle course races. They both love snorkeling and Brittany is a certified scuba diver. 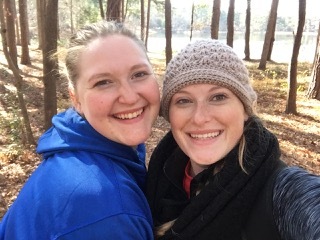 They both have a huge adventurous spirit and Morgan loves to explore the unknown.Brittany and Morgan are constantly encouraging each other to tackle new adventures. They are going to add a lot of excitement to our team with their energy and laughter. When they are not playing, Brittany is a Senior Occupational Therapist and Morgan is a Welder. Meg is a mother of three nature lovers. They spend most of their weekends in search of adventure. You will find them hiking in the Georgia and Tennessee mountains. Meg also spends some time on solo adventures. She has explored the pacific northwest, some southeastern beaches, the Rocky Mountains and Colorado Springs. Meg has planned next year to explore the jungles of Belize during the winter and volcanoes of Guatemala in the summer. Meg is a psychotherapist and has her own private practice in Peachtree City where she provides individual, group, and family therapy. She integrates yoga, mindfulness, and expressive arts along with other conventional therapies. She traveled to the Everglades to become certified in Dancing Mindfulness. We are excited to have her share her knowledge to help us empower women and share her passion for the outdoors. Stacy is an environmental consultant. She gets paid to play in the woods. The picture above was taken during her den work this past winter. Who wouldn't love to have her job? Her passion is to get women outside and to not fear the outdoors. She also teaches women to respect and protect our wild places. Stacy advocates for women of all sizes to get out and be active. Her loves are hiking, bird watching, and spending time with others outdoors teaching them ways to disengage from all the energy we are bombarded with on a daily basis, and how to re-energize and ground ourselves with the wonderful vibes nature has to offer. "Getting women outside the box and introducing them to new adventures really makes my soul sing"